The Walking Dead – Walkers Kill Count is a new app for the iPad (and iPhone) that lets you play along with episodes of the popular zombie apocalypse TV show, but in the UK only for now as the app is published by Fox International Channels UK. Hit the SYNC button at any point during an episode to connect your iPhone/iPad to the show, whether you’re watching live or later on catch-up. 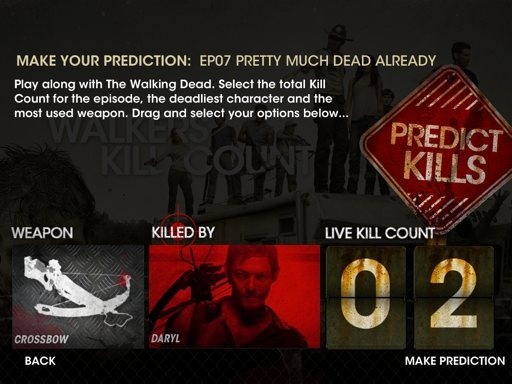 The Predict Kills section lets you select the total Kill Count for the episode, the deadliest character, and the most used weapon. You just drag on thumbnails and stop on your pick for each to make your selection. This is an app that’s intended for people over 18 years old. Right after the app’s splash screen there’s a screen where you need to tap to exit if you are under 18, or tap to continue if you are over 18. I’m a huge fan of The Walking Dead and very much looking forward to its return to AMC this Sunday. Now I’m also hoping AMC or Fox will release a similar app for those of us in the US. 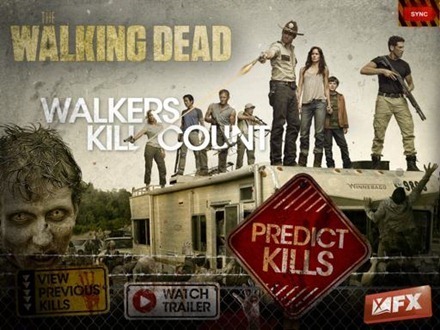 Here’s an App Store link for The Walking Dead – Walkers Kill Count; it’s a free app and a universal app designed for both iPad and iPhone.